Cupcakes 'n Daisies: Up Next . . . . I was so relieved to hear that several of you have a strong aversion to piecing backs just like I do! Although really, I don't mind piecing one, every now and then, but piecing several over the course of a week is not fun at all. Which is why I'm going to improve. I'm going to give 108" backings another try. Vintage Picnic by Bonnie and Camille for Moda will have 4 different 108" wide prints available, I'll let you know what I think of the quality and feel as soon as I get some. I'm also going to change my attitude about backs. A friend told me about a quilter named Diane Woodward who teaches classes on making "Happy Backs". I don't think she has a blog but she has dozens of clever quilt backs on Pinterest. She also has an Instagram account with the tag line "I make Mullet Quilts: Business on the front, party on the back! " What a great idea! I've created a few party backs, but I can definitely improve in that area. With all the backs done it's time to decide on my next project. I can't make more Village houses if I don't create any scraps! Have you happened to notice the myriad of sew alongs currently being promoted? Is it just me, or are there 10 times more than usual. Maybe I'm just in a sew along mood. I love sew alongs, sometimes I piece a quilt I would never have tried if it weren't for a sew along. Sometimes I start out thinking the project isn't for me, then see some amazing finishes and jump on the bandwagon, better late than never. This time of year I stay indoors and don't have much interaction with people, let alone quilters, so sewing with others is a great way to feel connected. Even if I don't participate, I always enjoy seeing what other quilters create. I'm following the Fat Quarter Shop's Crossroad's Quilt Along that's benefiting the March of Dimes. Also the Moda All Stars Row by Row sew along featuring their book All in a Row has some interesting starts. 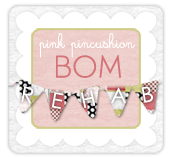 Pat Sloan is hosting or participating in several other sew alongs, check them out on her blog. And finally, Cindy at Hyacinth Quilt Designs is hosting an Outlined Plus Quilt Along. Cindy's blocks are amazing, I'm eager to see some other finishes. Here are some sew alongs that have I have moved from watching to my To Do list. The Fat Quarter Shop promoted their top ten videos of 2015 with a sew along for each project and the patterns were free. 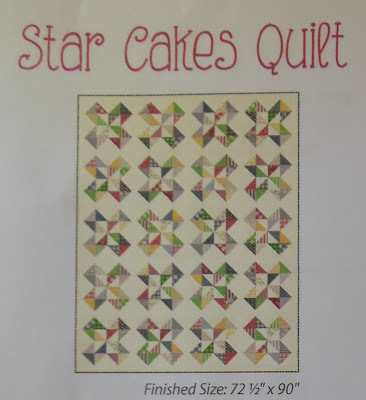 The Star Cakes Quilt was my favorite. And these bloggers created some inspiring combinations. There's even a $100 giveaway associated with this sew along, the deadline is 1/31. I love the Star Cakes block, and I love the hst's that make up this block, hst's are my favorite. 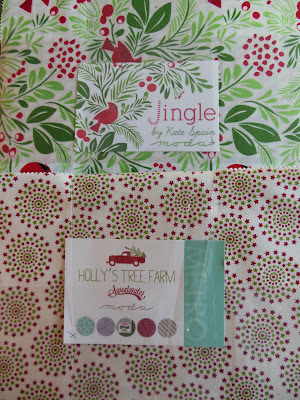 I was thinking maybe this would be a good pattern for my Christmas quilt goal. It uses a layer cake and I have two Christmas layer cakes. The only thing that's stopping me is that I don't think this quilt has a Christmas feel. 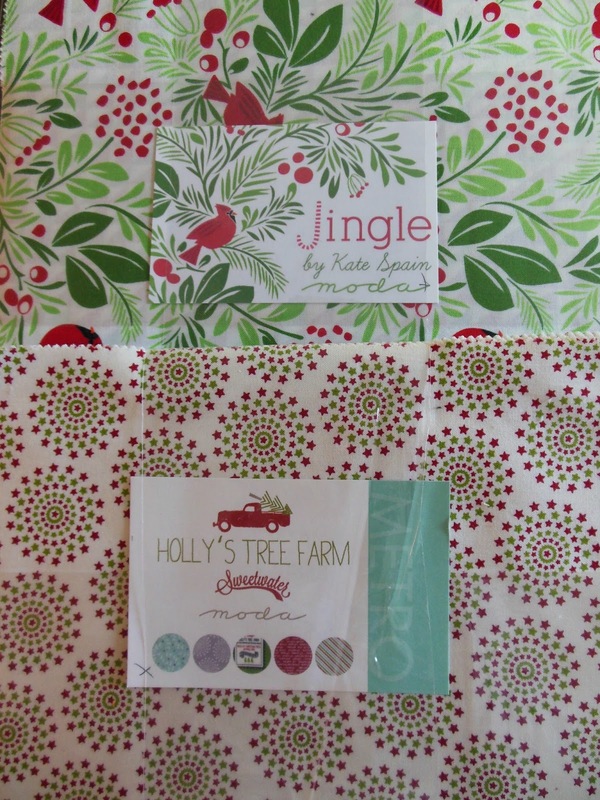 Do you think if I used Christmas fabric it would? There are two projects in the April issue of American Patchwork and Quilting, one project in the Spring issue of Quilts and More magazine, and a free pattern online. This year's theme is Plus Quilts. I participated in their sew along last year and made 3 projects. I can hardly wait for my magazine to arrive so I can start sewing along this year. 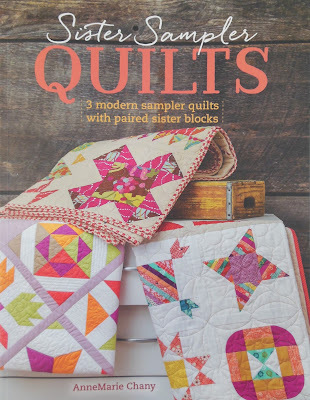 I love this book, Sister Sampler Quilts, by AnnMarie Chany, and was hoping to make a project from this book this year. Well there's a sew along for this book going on right now! (click here) That's a win win! I've selected my fabric and hope to get started this weekend, which should be easy, with no football I'll have plenty of time on my hands. I'm planning to use Basic Mixology by Studio M and Valley by Sherri and Chelsi for Moda. 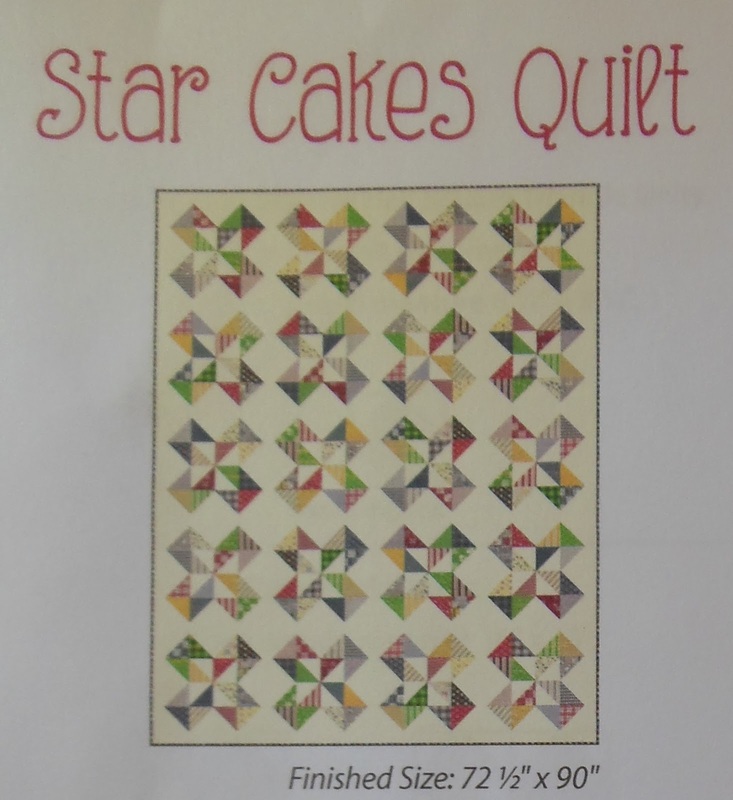 I run hot and cold on that Star Cakes quilt. It's all about the fabric and the placement, some I love and others less so. Good luck with yours! Thanks so much for the kind words on my book! 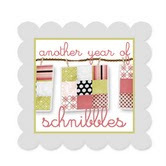 If you do sew some blocks this weekend, don't forget to enter the monthly giveaway. You can squeak your blocks in just before the end of January. :) Can't wait to see what you make! Beautiful fabric choices. Also loved the "border first" you put on Instagram!!!! Great concept!! I love quilt-alongs and BOMs! It's now the third year that I'm joining the Aurifil BOM it's free and fun. Then Pat Sloan's BOMs are always great, too. The FQS is a given, too, and I did join the Farmer's Wife 1930 Sew-Along (I'm almost finished, yeah!). Then last friday temecula posted the first blocks for their 'Circa 2016' mystery quilt and since I have a lot of small scraps this is a great way to use some. I'm sure if you use your LCs for the Star Cakes pattern it'll look great! I'm pretty sure you will be able to turn that quilt into a Christmas quilt; you have quite the talent for putting your own spin on a project. You could even add a little appliqué to the negative spaces, or something else incredibly creative! *sheepish smile* So I signed up for the two BOMs that are now patterns in Anne Marie's book and yet to make a single block. Oops! I have the fabric for them as well. I wanted to do the APQ Quilt Along last year, but then I chickened out. I like plus quilts so maybe will hop on it this year. Hey Thelma! I think that quilt would look GREAT in one of those Christmas layer cakes (with a cream/white background). I have a combination of cotton + steel fabrics cut out to make that quilt. Thanks for listing all the links-- they were inspirational. I have a pile of Doe fabric and will be making a baby quilt like Melissa of Happy Quilting-- that turned out really cute. I think it's a very versatile pattern. And I hear you on the backs-- I let them pile up and then have to have a very sad party to make a bunch. The only worse thing for me is machine sewing the binding onto quilts. Once I had a pile of eleven to do-- that was depressing. Best to try to keep up! I thought it was just me! There really are a huge number of sew alongs happening this year! I look forward to your review of the new backings. There are some really lovely wide backings out now! Tula's FreeFall is so beautiful and has the softest hand. I was really glad I hadn't found something for my Swoon. I had been buying fabric I liked when on deep discount for backings but I find that sounded better than it worked out. Fabric never seems right for quilts I am doing now or they the piece is a yard short...you get the picture! I will have to set aside some time like you did to knock them all out. Regarding your Christmas quilt goal, I can't remember where I saw it, but I saw a similar quilt (she designed the pattern prior to FQS release) that used the same basic construction, but didn't have the sashing. It was just a little more fun...not quite so static. We all must be in the sew-along mood! I'm participating in one on Instagram - it's Home for the Holidays by Primitive Gatherings. I've intended to make it for the last few years, but the SAL gave me that little push I needed to get it started. I'm anxious to hear your opinion on wide backs.